CAMP PENDLETON, Calif. – A Marine who pleaded guilty to kidnapping and conspiracy apologized Friday to his country, the Marine Corps and the family of an Iraqi man his squad killed. Pennington, 22, of Mukilteo, Wash., pleaded guilty Tuesday to kidnapping and conspiracy. He was part of an eight-member squad accused of kidnapping and murdering Hashim Ibrahim Awad, 52, last April in the Iraqi town of Hamdania. A murder charge will be dismissed, provided Pennington sticks to the terms in a pretrial agreement requiring him to testify for the government and remain on good behavior. He was the sixth member of the squad to plead guilty in the case, though one of those troops withdrew his plea ahead of his sentencing. The serviceman was interviewed by his civilian attorney, David Brahms. He did not take the stand and was not sworn in, meaning he could not be cross examined. 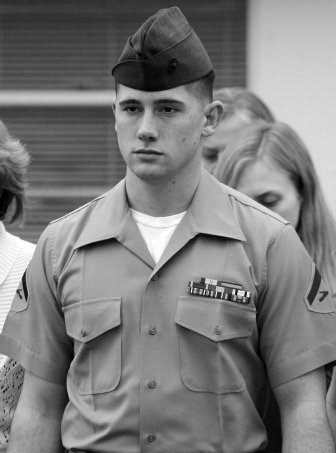 Describing his mission in Hamdania as “fuzzy at best and convoluted at worse,” Pennington said that as a Marine he had been taught to be aggressive, to take the initiative and to take the fight to the enemy. Under questioning from the military judge, Pennington said his squad had no legal justification for dragging Awad from his home and shooting him. Investigators believe the servicemen tried to cover up the killing to make it look like he was an insurgent planting a bomb. Pennington’s psychologist, Glenn Lipson, said Friday that multiple combat deployments, including one where he saw a close friend die, damaged Pennington’s mental health. He “seemed to be locked in a fight mode,” displaying many traits associated with post traumatic stress disorder, Lipson said. Pennington faces life in prison, but a shorter sentence is likely part of his pretrial agreement.